The anti-drone market is taking off at quite some rate. It’s not an exaggeration to state that if you care about your security in any way, there’s a very good chance that you’ve considered or will soon consider adding the threat of drones into your risk assessments. If you're responsible for a superyacht or luxury property then you should be aware that drones are taking your picture, checking where you park your cars and noting when you leave the house. The very nature of these fabulous boats and houses draws attention - desirable or otherwise - which is precisely what owners usually want to avoid. What’s your appetite for risk? Are you averse or tolerant? How does your assessment process consider the likelihood and severity of a drone threat? The objective target for incidents should be zero, of course, but in reality creating a situation where the risk is ‘tolerable and as low as reasonably practicable’ is a working solution. Many organisations claim to be risk averse, but it’s likely that while there may be a line on a risk assessment, little practical mitigations are actually in place for a number of threats. This is not a criticism, merely an observation of the budget-driven reality of security. Resource prioritisation is the perpetual burden of any manager and security is no different. 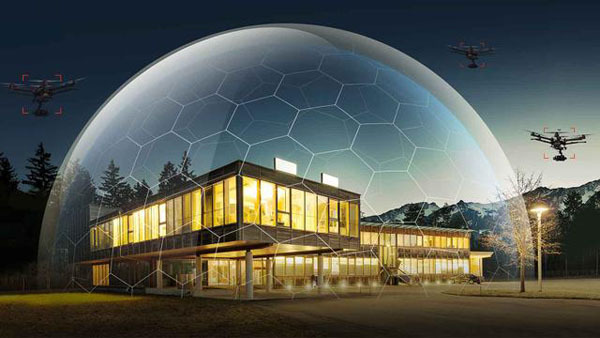 From a practical perspective, what means are available to protect you against drones? Regulation plays a big part. This both manages the benign drone operator, be they hobbyist or commercial, and helps restrict the availability of unregistered drones. Regulation helps prevent a benignly intended but incompetent operator accidentally infringing your privacy. However, the malignly driven person is unlikely to be dissuaded by rules. Burglars know that breaking into a house is against the law but still they burgle. Drones are a paparazzi’s dream. Much easier than lurking in the undergrowth with a massive telephoto lens. Thankfully there are options beyond mere regulation. We see a lot of ‘solutionising’ in this industry. Buy some equipment and then work out what to do with it. This is letting the tail wag the dog. At Quantum we prefer a requirements driven approach. What actually is your problem? You may not know exactly so do a risk assessment and get professional help. Of course, this comes with its own dangers so remember the cliché ‘if you think professionals are expensive, you should see what an amateur costs’. Do your own due diligence on anyone purporting to be an ‘expert’. Are they really experienced in the field? Can they prove it? The anti-drone industry, like any other, is full of snake oil salesmen. Before you commit to a product, check if it’s really in production and out there getting used, there’s a proliferation of beta systems – you don’t want to be surprised the system works! Quantum use a blend of sensors to protect a project – every situation is different and demands a bespoke approach. Call us. We’ll be happy to help.